MangoApps simplifies enterprise systems integration with it’s in-built modern integration platform. Traditional applications typically are built on a client-server model that do not take into consideration the need for communication compatibilities with other systems. To remedy this disconnect, application programming interfaces (APIs) are added later to accommodate system-to-system integration. This low-level approach even though allows for integration, it unfortunately also greatly increases the cost and complexity of building and supporting them. Typically, achieving a more comprehensive integration to necessary bolt-on systems required significant programming, which only adds to the cost, complexity, and rigidity of these integrations. Unlike traditional enterprise application providers, MangoApps understands the importance of integration to core systems of record and started with integration as fundamental architectural and application design criteria. 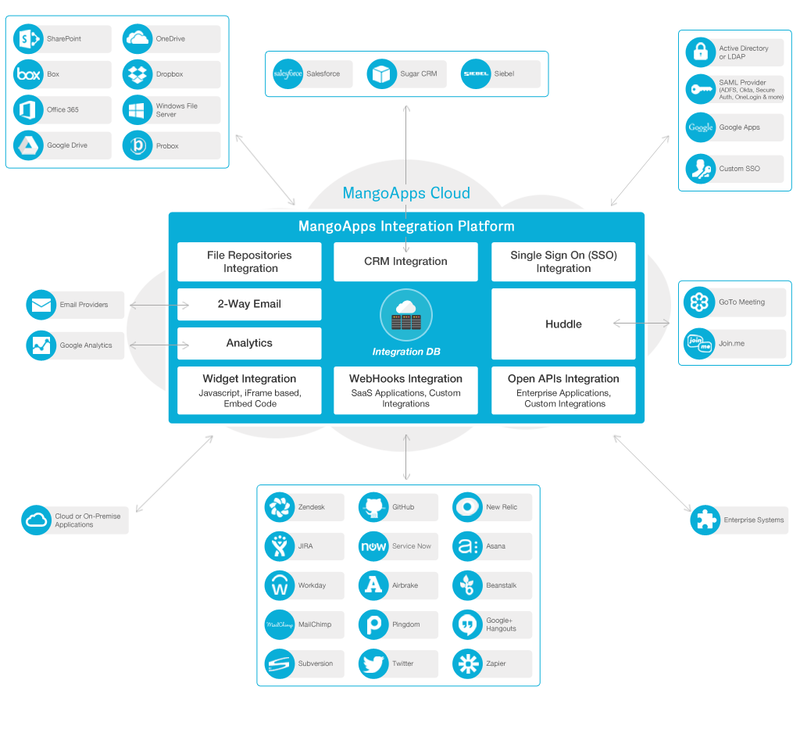 MangoApps approach is for connectivity to other applications and resources to be simpler to build, deploy, manage, and evolve over time—a significant and long- awaited change from the cost, complexity, and rigidity of connecting to traditional enterprise systems. Custom Integrations Without Programming: MangoApps platform comes with the following lightweight custom integration options which MangoApps admins can use to integrate an existing enterprise system with MangoApps without any custom software development effort.